N.B. : (1) Though not mentioned here, this article responded to the twin bombings of American embassies in Kenya and Tanzania on Aug. 7, 1998. (2) The following text reflects what the author submitted, and not exactly what was published. To obtain the precise text of what was printed, please check the original place of publication. On their way to power in Iran in 1978 Islamic fundamentalists shouted "Death to America," and they haven't stopped in the 20 years since. With this cry they declared war on the United States. Last week, in a stunning development, the U.S. finally responded. Now let's hope that the missile attacks on Sudan and Afghanistan truly mark a turning point, as U.S. President Bill Clinton and his aides have promised. By fundamentalists I don't mean traditional, pious Muslims who attend mosque and do their best to live by Islam's many laws. The fundamentalists I'm referring to are those Muslims who practice a distinctly 20th century, politicized version of Islam. They have turned an ancient faith into a modern-style ideology. Rejecting the "isms" that have come out of the West, such as liberalism and communism, they have declared that their version of Islam is an all-encompassing political outlook superior to anything the West can produce. A state of war exists between them and the West, mainly America, not because of the American response but because fundamentalist Muslims see themselves in a long-term conflict with Western values. When Hasan at-Turabi, the effective leader of Sudan and a leading fundamentalist thinker, explicitly states that the Muslim world is currently at war, "Against its attackers, led by the imperialist powers - chiefly the U.S. and Israel," it's not hard to miss the point. A closer look reveals that these fundamentalists, despite their viciously anti-Western views, have in fact imbibed some Western ways wholesale, and often right at the source. It's hardly accidental that so many of them, whether leaders or terrorist operatives, are engineers. They pride themselves on having mastered some of the West's most privileged knowledge. Why, then, do they see themselves in battle with the United States? To understand, it's best to see them in the framework of other 20th century revolutionaries that upheld totalitarian causes. Like fascists or Marxist-Leninists, they are absolutely convinced that they know how to achieve the just society, (in this case, through the minute application of Islam's many laws in all spheres of life, including the political); they rely on the state to remake human beings; and they are prepared to destroy anyone who obstructs their path. Also, like fascists and Communists, they viscerally hate the United States. Americans - individualistic, hedonistic, and democratic - challenge all they represent, and the U.S. stands as the single greatest obstacle to fulfilling their vision. They hate Americans for who they are, not for what they do; short of giving up the American way of life, the U.S. cannot please or appease them. This is why "Death to America" is not empty rhetoric. Time and again, fundamentalist radicals have assaulted American citizens and institutions. It began in 1979 with the 444-day seizure of the U.S. Embassy in Tehran; other highlights in the drumbeat of horrors include: explosions on airliners (Pan Am 103), at U.S. embassies (in Lebanon, Kuwait, Kenya and Tanzania), military installations (in Lebanon and Saudi Arabia), and commercial buildings (the World Trade Center in New York). The total death toll from all these and dozens of other attacks numbers over 600. In other words, more Americans have been killed and injured by Middle Eastern-related terrorism than by any other hostile force since the end of the Vietnam War. 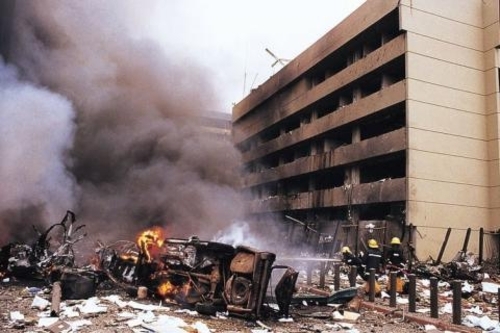 Two bombings destroyed U.S. embassies in Kenya and Tanzania. What to do about it? Unfortunately, the U.S. government until now has seen this violence not as the ideological war it is, but as a sequence of discrete criminal incidents. This approach turns the U.S. military into a sort of global police force and requires it to have an unrealistically high level of certainty before it can go into action. Basically, it must have proof of the sort that can stand up in a U.S. court of justice. When such evidence is lacking, as is usually the case, the terrorists get away with their perfidy. This explains why last Thursday's retaliations against sites in Afghanistan and Sudan were only the second such action in 20 years, the last one being the April 1986 bombing of Libya. In the vast majority of cases, the criminal paradigm assures that the U.S. government does not respond and killers of Americans pay little or no price. The paradigm needs to be shifted. Seeing acts of terror as battles, not crimes, changes and improves the whole approach. As in a conventional war, America's military should not need to know the names and specific actions of enemy soldiers before fighting them. When reasonable evidence points to Middle Eastern terrorists having harmed Americans, U.S. military force should be deployed. If the perpetrator is not precisely known, then punish those who are known to harbor terrorists. Go after governments and organizations that support terrorism, not just individuals. What to target? Missile installations, airfields, navy ships and terrorist camps. In every case, the punishment should be disproportionately greater than the attack, so that it stings. The U.S. has a military force far more powerful than any other in the world; why spend hundreds of billions of dollars a year on it and not deploy it to defend Americans, or spend tens of billions for intelligence services if they're not able to finger suspects. Last week's missile attacks will have long-term significance only if they are not a one-time event, but the start of a new era in which the U.S. government establishes a newly fearsome reputation. From now on, anyone who harms Americans should know that retribution will be certain and nasty. This means that Washington must retaliate every single time terrorism harms an American. To those who say this would start a cycle of violence, the answer is simple: That cycle already exists: Americans are murdered in acts of terrorism every few months. Further, American retaliation is far more likely to stop it than to spur it on. The fundamentalists, and others, such as Saddam Hussein, despise Americans as morally flabby and militarily incompetent ("paper tigers" is what Osama bin Ladin calls them, borrowing Mao's words). Showing their teeth, Americans are far more likely to intimidate their enemies than to instigate further violence. It'll be a happy day when American embassies are again built in busy downtown intersections out of normal materials - and not, as they are now, bunkers located in distant lots surrounded by high fences. Such a change will only be possible when the safety of Americans depends not on walls, metal detectors and Marine guards, but on the deterrence established by years of terrible retribution against anyone who so much as harms a single American citizen. Oct. 1, 2001 update: I update this analysis for post-9/11 consideration at "War, not 'Crimes'." Related Topics: Counter-terrorism, Radical Islam, Terrorism, US policy | Daniel Pipes receive the latest by email: subscribe to the free mef mailing list This text may be reposted or forwarded so long as it is presented as an integral whole with complete and accurate information provided about its author, date, place of publication, and original URL.